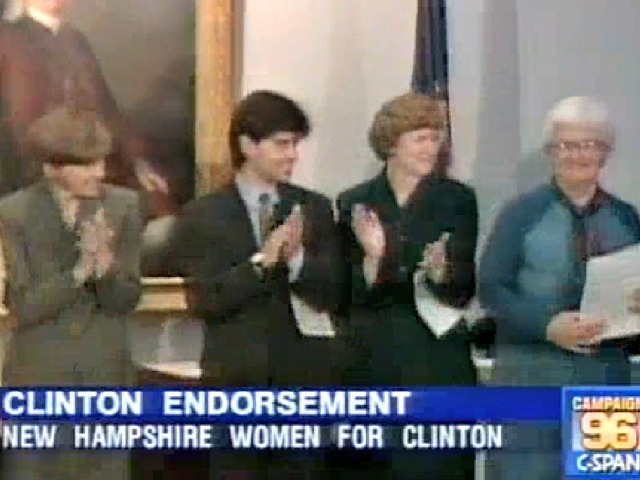 MANCHESTER, New Hampshire — Video captured by C-SPAN in 1996 shows George Stephanopoulos, then a “senior adviser” to President Bill Clinton, accepting on Clinton’s behalf the endorsement of then Democratic state Sen. Jeanne Shaheen, among others. What a way to return to New Hampshire surrounded by all these women, I’m only sorry I couldn’t come on Valentine’s Day. But let me seriously thank Susan McLane and all the New Hampshire Women For Clinton for this endorsement today and for the outpouring of support. As they have all said, the values that President Clinton fought for in 1992, the values that all of you fought for in 1992, and the values that the president and Vice President [Al] Gore and Hillary Clinton and Tipper Gore have fought for for the last four years are the values we’re going to continue to fight for in this election. Your endorsement today of the president’s family values, his determination to fight for economic security for every single American, his determination to meet the challenge of protecting our environment, having clean water and clean air for our children and grandchildren, his determination to protect the right to privacy for every American, his determination to make sure that we have educational opportunities and healthcare security for every American, are the values that brought him to office in 1992, and they are the values that bind this country together. Earlier in the video, Shaheen endorses Clinton’s re-election campaign–an endorsement, among the others in the video, Stephanopoulos was there to accept on Clinton’s behalf. McClane, the state senator behind the endorsement by New Hampshire Women For Clinton, was a liberal Republican. Her daughter is Democratic incumbent Rep. Ann Kuster (D-NH), who is being challenged by Republican Marilinda Garcia. Stephanopoulos will be hosting Thursday night’s debate between former Sen. Scott Brown and Shaheen, despite this conflict–he’s on video as a political activist accepting Shaheen’s endorsement of President Clinton–and another conflict. As Breitbart News reported on Tuesday, Stephanopoulos has a longtime personal and political relationship with Shaheen campaign adviser Mandy Grunwald. Stephanopoulos has a history of flubbing debates, and he is widely credited with creating the “war on women” in a 2012 GOP primary debate–inserting the issue of contraception into the debate when nobody was discussing it at all. What I would ask everyone watching tonight and everyone here when you watch this Republican debate tonight, look up at that stage and ask: Is any one of those candidates speaking about the need to protect the environment? Is any one of those candidates speaking about the need to make sure we have real educational opportunity for every child in this country? Is any one of those candidates talking about how we can bring this country together rather than how we can tear it apart? I think the answer to that is no. The answer is that the only candidate, the only president who has really worked for families, and the values that will really make a difference to every American family and every woman in America, is Bill Clinton. The women in New Hampshire today are sending out a message all across the country, whether you’re Democrats or independents or Republicans: President Clinton is fighting for you and fighting for your values. This scroll emphasizes that support, and we are very grateful in the White House to accept it today on behalf of the president. Let me thank you, Susan, and let me thank all the women of New Hampshire for this vote of support. Thanks very much. Breitbart News has asked Stephanopoulos to comment for both this story and the previous one. While he has not responded with an actual comment–nor has an ABC News spokesperson–an ABC News spokesperson has confirmed that Stephanopoulos did receive Breitbart News’ requests for comment and didn’t answer any questions about his conflicts of interest. Brown, while on Fox News on Wednesday morning, said he does have some “concerns” about this.